Uncle Sam Expects You To Keep Hens and Raise Chickens !! Discussion in 'Announcements, Feedback, Issues, & Guides' started by Nifty-Chicken, May 29, 2010.
only a few minutes a day. can care for a few fowls as well as a grown person. 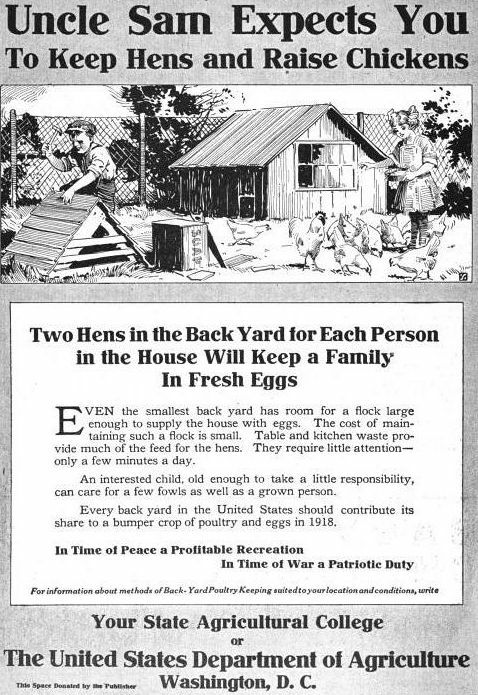 Every back yard in the United States should contribute its share to a bumper crop of poultry and eggs in 1918. "Every back yard in the United States should contribute its share to a bumper crop of poultry and eggs..."
That sure sounds like our vision: "A chicken in every yard!" Lady of McCamley, leighks, Flockandfowl46 and 23 others like this. maybe you could change the date on it to 2010, and distribute it nation wide. The politicians won't remember if it's something they approved of or not. leighks, Glitterchicks, graybushfarm and 7 others like this. leighks and graybushfarm like this. That is cool. I love old timey stuff like that. Quote:"Every back yard in the United States should contribute its share to a bumper crop of poultry and eggs..."
I've just printed 20 copies for random distribution around town. Sometimes living in a college town rocks! Gonna make a great poster!!!! I'm trying to get a higher resolution version / scan. There may be one in one of the Google Book scans linked from the first post.